The Gold Bullion Company is located in the heart of England, in Birmingham's world famous Jewellery Quarter. The Gold Bullion Company offers fine gold, silver and gold coins for investment or gifts at unbeatable prices. Paul Marcus, its founder has been trading in gold and silver bullion for over 35 years and is well respected for his honesty, integrity and trust. The Gold Bullion Company website enables customers to buy gold online using their credit card, debit card or bank transfer. We offer all customers a Buy Back Guarantee, ensuring customers can quickly and easily liquidate their physical gold or silver investments back into cash. 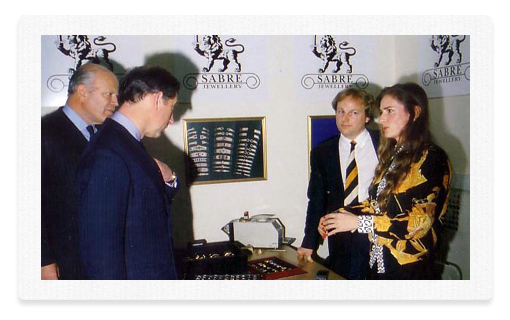 HRH The Prince of Wales being presented with a pair of 18ct gold cufflinks by Paul Marcus. The Gold Bullion Company and Scrap Gold UK are now trading names of Group International Ltd. The Gold Bullion Company has extensive knowledge of the precious metals market from the point of view of both selling and buying. You can buy from us in complete confidence and we pride ourselves that our customer service is second to none.